The state of Gujarat is still under the influence of summer heat with the temperatures soaring above the 40-degree mark. Pre-Monsoon activities have not occurred over the state for a long time. 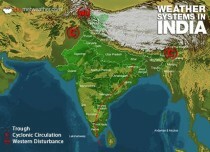 In general, also, the state does not enjoy pre-Monsoon activities during this time spanning from March to May. It is during the month of June that the state witnesses some activities, particularly, during the second half of the month. However, Southwest Monsoon has arrived in the Southern Peninsula and with its arrival, a little change in the wind pattern was seen. Isolated pockets of the state got to witness some light pre-Monsoon spells. Though these spells were confined mainly to the southern parts of the state in cities like Amreli and Surat. On the other hand, almost the entire state continued to remain dry. However, now some pre-Monsoon activities are expected to show up over the southernmost state of the country. As per Skymet Weather, Southwest Monsoon has already arrived in the southern parts of Maharashtra, over Ratnagiri and Solapur. The extension of Southwest Monsoon over the northern half of Maharashtra would, in turn, give a day’s pre-Monsoon rainfall over the southern and Central districts of the state around June 12 and 13. A few regions of Saurashtra would also get influenced by these regions. These spells would be more in cities like Surat, Amreli, Kandla, Veraval, Porbandar, Vadodara, and Vallabhnagar. Moreover, the expected date of the arrival of Southwest Monsoon is June 15 but this year, Monsoon is expected to make an onset over the state a little before time.